In this week’s episode, Robert shares the amazing experience he had over 40 years ago in which the details are still crystal clear. He tells us the manner in which he left his body, who he met outside his body, and the profound knowing he learned during his experience. I explain the difference between an out-of-body experience (OBEs) and a near-death experience (NDEs) and why Robert’s story interestingly has indications of both. In discussing some of the hallmarks of OBEs and NDEs, I talk about the interesting role religion often plays and, finally, I explain the importance of the Akashic Records and how they assist in our spiritual growth. There’s so much to gain from this week’s episode, you don’t want to miss it! Thank you to all of you who’ve left Amazon reviews for both of my books, Answers About the Afterlife and my newest book, The Magic Mala. I’m so grateful for your feedback and the experiences you’re having as a result of reading them. Please leave your comments for the show on AfterlifeTV.com, YouTube, Facebook and Twitter. I’d love to hear from you! Photos, as always, are sweet Melissa’s. Bob: Hey, everybody. Bob Olson here with Afterlife TV. You can find us at afterlifetv.com. This is where we talk about life after death and answer the meaningful questions you have around that subject. This summer we’ve been doing a lot of bite-sized episodes. The bite-sized episodes are shorter, and we typically we’ll play a story. Maybe play somebody asking a question, and then comment on that story. A lot of you have been loving the bite-sized format. You know, we’re very busy in the summer. I understand that, and I understand why it’s just great to be able to listen to something that’s 10 or 20 minutes long. 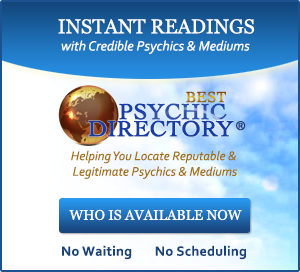 I just wanna thank our sponsor as always, Best Psychic Directory, which you can find at bestpsychicdirectory.com. This is my site. And we have now over 900 psychics and mediums, and animal communicators, and energy healers and Tarot readers. All sorts of versions of psychics and mediums. 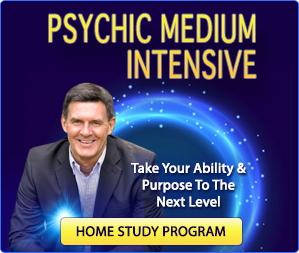 Psychics being people who can read your energy, maybe tell you a little bit about your future. Maybe help you work through an issue that you’re dealing with, overcome an obstacle, help you choose a direction, make sure that it’s just confirmation of what you were feeling anyways. Or mediums, who communicate with people in spirit. You may not believe in it, there’s plenty of us who do. I did a 15-year investigation of it. Really that never really stop. I’m now into over 18 years of investigation of it. And I’m thoroughly convinced that we have these incredible people who have this valuable gift and they’re able to use it to allow us to connect with our loved ones in spirit, and they’re called mediums. 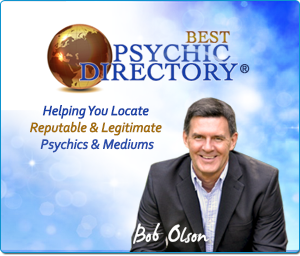 So again, today’s sponsor is Best Psychic Directory at bestpsychicdirectory.com. Listen, we’re gonna jump right into it. Our guest today, his name is Robert. He’s an 83-year-old-man. At least he was when he left this, which was quite a few months ago really. It’s an incredible story. I only waited this long because it needed a lot of cleaning up. Not his fault, just the audio that came through. You’ll even notice it’s a little weird at times, sounds a little spooky. Just the way the audio comes through sometimes. Sounds a little bit like they’re underwater or something every once and a while. I cleaned it up as best I could. I think we can understand him really well. I’ll let you listen to it. Here we go. Robert: My name is Robert. And I have an outer-body or near-death experience, or type experience to relate to you. I wasn’t clinically in a near-death condition. In other words, you know, I wasn’t ill, or even taking any medications by that time. But I had the same identical experience that people have had all over the world, the tunnel and all that stuff. Incidentally, I had not heard about the tunnel, the light, and all that kind of stuff prior to that, so I didn’t have that subconsciously influencing me in this experience. And I’m 83 right now, but this would be over 40 years ago. Our oldest son was just a baby, and dawn or early hours of the morning, I heard him crying. Normally, of course, the mother will wake up. You know, she has a built-in sensor I think. This case, my wife didn’t wake up, I did. Anyhow, I got up, got him settled down in his room. And then I came back, started to go to sleep again. I had to work the next morning. So as I was falling asleep, and I was laying on my left side as I recall. [Inaudible 00:03:36] strangest sensation I’ve ever experienced in my life. Never had it before, or since this incident. It was like a tingling sensation from top of my head to tip of my toe. You know, I was kinda wondering, “What the heck’s going on?” It was so strange. And then, then I began to feel my…it’s hard to explain it if you just never experienced this. But I began to feel my consciousness, whatever that is. Science can’t quite explain what consciousness is. But my consciousness began to drift away, for one of a better word, from my body I could feel it, the separation. The separation taking place. And now I really began to get a little scared, you know. I thought, “My God, I must be dying.” And I felt okay, I didn’t feel bad or ill or anything like that. Next thing I know I’m in a tunnel, felt like a tunnel. Just black, dark, but I was traveling. I mean the sensation was as if I were physically traveling at a high rate of speed through this tunnel. And then suddenly there’s a tremendously bright light, and I heard this most incredible music. I can’t recapture it. I mean I can’t tell if you it was orchestral or choral or a combination. All I can say it was literally out of this world. And then I saw a figure in the light, or the outline of a figure. As I got closer, he had, he was dressed in biblical attire. Like long hair and the robe and sandals. And for some reason, I don’t know. I wasn’t surprised. I don’t know, as if I knew him but yet I didn’t know him. But it didn’t occur to me it might be Jesus. For some reason I…you would think that kind of description would, you’re thinking, “Oh, this must be Jesus.” But that thought never occurred to me. Somehow I knew it wasn’t Jesus. It seemed obvious that they would stop if they could see or feel this. I knew that was very, very important. That there’s a price to pay somehow, even if you escape, the law as we know it. I made laws. A part of those universal laws that…everything’s recorded somehow. Apparently, it’s a teaching mechanism. So anyways, the next thing I know, it seemed like we spoke for hours. I wish I had looked at the clock before all this happened, so I knew how much time had elapsed, but I’m guessing not that long. So anyway, I came back and suddenly I’m back the way it was before. And still leaning on my left side, still tingling, but the tingling or vibrations, whatever it was, was gradually subsiding. And then I just lay there wide-eyed, just astonished. And I’m thinking, “I got to wake my wife up and tell her about this and this amazing experience.” But then I thought, “Well, you know, she won’t…probably think I’m dreaming.” And I knew without a doubt, this was not a dream. Well, first of all, it started while I was awake and it ended I was awake. So, plus the reality was, I know dreams can be very vivid, but this was absolute reality. Nothing like our reality, it was much more intense. Bob: Well, you’re back. You’re listening to Afterlife TV at afterlifetv.com. That was such a cool story, wasn’t it? Thank you, Robert, for leaving that story. I really enjoyed that. It’s interesting, you know, the way you described it as an OBE or NDE. I understand why you say that. It’s a little bit of a combination of the two. Interesting, because the out-of-body experience, the OBE, would be a little different, especially, where it was, you know, your first one that you became conscious of. Typically, you probably might leave your body, and maybe you’d see your body laying on the bed. Or wouldn’t even leave the room, that sort of a thing. You might get scared, and then find yourself back in the body. You went from like, this out-of-body experience in the way that it started because the tingling sensation throughout your whole body is definitely something that people who have had lots of out-of-body experiences have described. That’s the way it starts quite often. And then the consciousness, you know, you talked about that your consciousness began to drift away from your body. That’s a really great way of describing that, even to the point where you’re a bit scared, wondering if you might be dying. Later, you sort of talked about your wife maybe thinking this was gonna be a dream. Obviously, that’s not the case. These kinds of thoughts about you getting scared by all this, the wondering if you might be dying, these are more conscious thoughts. These are things that you would have within your own conscious mind. And so that’s all very out-of-body experience like, but then you go into the tunnel. And that’s a little bit more near-death experience-like, and what we’re familiar with a lot of near-death experiences, NDEs, and that you’re traveling at a high rate of speed. I think that’s kinda cool. You recognize that you felt like you were going at a high rate of speed. I just find that interesting, curious. Then you see the bright light, again very NDE-like. You don’t describe the bright light too much other than it was just this very bright light. But you also describe the music, this incredible music but you said you can’t recapture or even really describe. I like that you mentioned it. Obviously, it was significant, you wouldn’t have mentioned it. Because lots of people, especially ,people who have had near-death experiences, have described this music. They said, you know, almost impossible to describe, that people have tried. It’s one of those things that I guess you never forget. Here you are 40 years later, we keep repeating this on this show, here on Afterlife TV that when you have these experiences, whether it be a dream visitation, or what you had what I would describe as an out-of-body experience or the near-death experience. It doesn’t matter, 40 years later, it’s still very vivid, very clear in your mind as though it just happened. And here you are, having all these memories about the bright light, the tunnel, the music. And then you see this figure in the light. What I really like about this figure that you see in the tunnel, is that you said you knew him. You felt as though you knew him. And it’s very interesting because you’re, in hindsight now, and you’re going, “I don’t know why I didn’t think that this was Jesus, but I knew it wasn’t Jesus.” But your mind’s now engaged and going, the appearance of this person, of this being, reminded you of a religious figure that you would have probably thought was Jesus if you were not having this sort of experience where everything is a knowing. But the mental processes are not working in the same way, if they’re working at all. But in hindsight, you recognized you knew, that you felt as though you knew him but it wasn’t Jesus, but it was in the image of someone that you thought might be Jesus. And this is very typical. Beings are actually beams of light, right? But they show themselves to us, regardless of what the process is, whether it be a near-death experience, whether we’re in the dying process and we’re crossing over to the other side, whether you’re having an out-of-body experience. It doesn’t really matter. Beings whether they be our loved ones in spirit, our spirit guides, some kind of spiritual masters of some sort, whatever it may be, they show themselves to us in all sorts of different ways, but many times they will appear in such a way that we’re not fearful of them, that they make us feel comfortable and not scared. And as a result, for many people, they will appear as a religious figure. So in other words, many people will see, we call this person like a greeter. You know, they’re having a near-death experience, and they’re greeted by a spiritual being. And many times it will be a religious figure, but it’s always of the religion that that person followed. So, you know, to me it’s always very interesting. And very clear in the message that we can learn from this is that not once have I heard of someone saying you know, “I was this religion but I saw a figure that is more prominent in this other religion.” You know, it’s always the figure that they see is related to their religion. Anyways, little digression there, but I find it interesting. Then you get into this whole really interesting dialogue about things that you see, things that you experience and know there. And you’re recognizing that if people on earth could see this, all the bad stuff would stop immediately, right? That is an interesting thought, and obviously, Robert, while you brought it up. One being that you recognized you were saying if people on earth, and so you’re already referring to yourself as though you’re not. You know, you’re in some other place. You’re in some other dimension. And then, you’re relating to, “Boy, if they could see what I am seeing. If they knew what I knew right at this moment, all the bad stuff would stop.” Really interesting thought, and I love that. But then you sort of go forward with it, and you’re recognizing maybe the reason why things are the way they are, but also that you said, “Everything is recorded somehow.” And we, typically, people in this field would call that the “Akashic Records.” Everything is recorded, and we’ll just say, because we do this so that our human minds can kinda understand it, everything is recorded in this one place that we call the “Akashic records,” so that it’s a teaching mechanism. Who was it a teaching mechanism for? Well, other spiritual being surely, including ourselves as spiritual beings. Our soul, or what I would call our soul, it allows us to retrieve the memories of the lifetime, the human or even inhuman, if that would be the experience. But any lifetime experience that we would have as a physical being, not a spiritual being, it would be stored in these Akashic records so we could always retrieve that, and learn and grow from it. So much we can gain from your experience, Robert. I’m so glad that you shared it with us. And I’m sorry it took so long for us to share it with everybody else, but I’m glad that I was able to clean up the issues that we had with the audio recording, and it was really well worth it. I appreciate it. I appreciate you, Robert. And I hope everybody enjoyed that. So that’s it for today’s Afterlife TV episode. 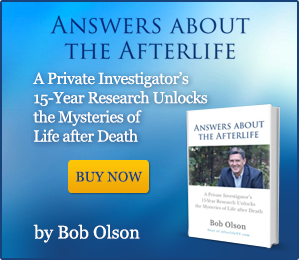 I wanna thank everybody who has been leaving reviews for both of my books, “Answers about the Afterlife.” Surely, if you’re a fan of this show, or if you’ve just found us, you would be interested in that book, “Answers about the Afterlife” by Bob Olson. Or my newest book, which is, “The Magic Mala,” which is a fictional story that teaches a lot of the things that I learned while investigating the afterlife, but there are things that I learned about life. Some of our most recent reviews on “The Magic Mala,” subtitle, “A Story That Changes Lives.” I’ll just thank the people who left them. Betty Couch, Jennifer Sanders, Diane, Nancy Crum, a couple Amazon customers here, Michelle Ramgee, Judy, Austin Mum and Bean. I wanna thank all of you for leaving these reviews that say, “All of my friends loved this book as I did.” “Great story.” “Spellbinding.” “A must-read.” “The ending was awesome.” “I absolutely loved it.” “It appeared at a time that I so needed it, and is now enhancing my spiritual practices.” All of you, thank you very much, I appreciate it. I appreciate all of you, for all your comments. Please leave them in all the normal places on social media, on afterlifetv.com. Until next time, have a great week. Bye now.